If you are not completely satisfied with your order we can offer either a refund or exchange providing that goods are returned to us unopened and in their original packaging within 7 days of receipt. Please ensure that the package is wrapped securely and for your protection we recommend that you use a recorded delivery service. Please note that special order items (items we ordered in specifically for you) can only be returned if they are faulty. You MUST request authorisation to return before sending any product back to us. In circumstances where goods are returned without prior authorisation we may refuse to accept delivery. Log-in to your account and go to the order history in your account. Select the order and follow the instructions on screen. We receive notification of your request and will update the request as soon as possible. WAIT until the return is authorised, then use the returns note that will become available in the order history as soon as we have authorised it. Send the goods back unopened and in their original packaging. We aim to handle your returns within seven working days of receiving the goods. If the goods are being returned because they were incorrectly supplied, then we will also refund the postage and packaging costs. If you are returning an incorrectly purchased item(s), that we correctly shipped, we will not refund the order shipping charge. Please note that if you have not purchased your products via this website you will need to arrange your return or exchange directly with the place where you bought them. We aim to process and ship your order as quickly as possible. However, if you wish your order to go out on the same day as it is placed please note that it will need to be with us before 12 noon (weekdays only). We cannot be held responsible for direct or consequential losses arising from 'late' deliveries. Any claim you wish to make should be made direct with the courier. Any claim under warranty must be made in writing. You may use the 'Contact Us' form on this web site or call for instructions. Any warranty is on a 'return to base' basis - it is your responsibility to ship the goods to us (CVW Distribution Ltd, Hooks Drove, Murrow, Cambridgeshire, PE13 4HH). Please pack the items adequately because any shipping damage is at your risk, and include a copy of the original invoice in the package. Once inspected and verified, we will either repair or replace goods at our discretion. Standard orders are processed on the day of receipt (excl. weekends and bank holidays) and should be with you the next working day (mainland UK only). Orders placed on Saturdays, Sundays and holidays will be processed the following business day. If it has been more than six working days and you have not received your order, please contact customer services by email through this website or on +44 (0)1945 701241. Please note that processing times may increase occasionally when there is especially heavy demand. If you are returning an incorrectly purchased item(s), that we have correctly shipped, we will not refund the shipping change. STOP - Don't send anything to us without reading this and contacting us FIRST ! Claims under warranty are now handled with this revised procedure. Our warranty is 'Return to Base' in other words it's your responsibility to return warranty claim products to us, at your cost and at your risk. So pack up products securely to make sure they don't get damaged on the way back to us, because you will need to make a claim if they become damaged while on the way to us. It is in your best interest to check first that everything has been installed correctly and that the product is used in the way that it is intended. Warranty claims will be declined if the product has been misused or incorrectly installed. Locate the details of exactly when you bought the product from us. We will need your order reference, purchase date and the serial number of the product. Contact Us to discuss the fault/problem BEFORE sending anything back. Securely package the product and return it to us. It is your responsibility, risk and cost to return products. We will examine the product and, if applicable, set it up on test. If the product is working correctly we will return it to you. If the product is faulty we will send out a replacement product, or provide you a credit for the purchase cost of the product. In the situation where you need a replacement product before returning the faulty one, you will need to buy it through the on-line shop. Replacement products are not sent out until we have received the product (in good condition) and verified the fault exists. 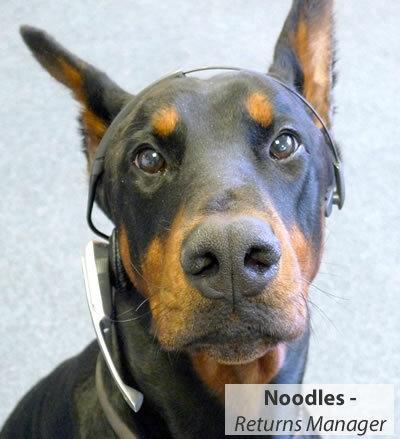 Mr Noodles is known to accept bribes in the form of chicken pieces to speed a warranty claim.